On January 7, 2015, two muslim brothers – Said and Cherif Kouachi – killed 12 and wounded many others in Paris in an attack on the offices of Charlie Hebdo because they insulted Islam’s prophet. 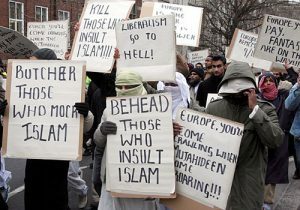 Around the world non-Muslims are being threatened with death and killed for “insulting” Islam’s prophet Mohammad. Because Mohammad himself commanded, condoned, and called for it. He is the “perfect example” in Islam for muslims to follow. His sayings and actions are recorded in the hadith. The most authoritative hadith scholar recognized in Islam is Bukhari. And Ka’b bin Al-Ashraf was killed. Slander is a capital crime under sharia. To “insult” a muslim is to be threatened with death for exercising the God-given right of free speech. They are simply following core teaches of Islam and its prophet. In the Minneapolis, Minnesota the muslim population there also believes anyone who insults Mohammad should be killed. See this video by Ami Horowitz in which he simply walks the streets of the muslim majority Cedar Riverside neighborhood asking simple questions. Muslims, including a “nice” muslim lady, tell him those who insult the prophet should be killed (3:32 mark on video). Yet, local and state leaders in Minneapolis/St Paul continue to ignore the growing cancer of Islam in their community which holds these ideas and supports the sharia which calls for barbaric punishments and actions antithetical to our Constitutional republic – like killing people who “insult” Islam or its prophet. Instead local and state officials in Minneapolis conduct outreach to muslims and condemn anyone who “insults” Islam. This is the enforcement of the Islamic Law of Slander without stepping foot into a courtroom. Each time UTT schedules its 3-day “Understanding and Investigating the Jihadi Network” for law enforcement around the nation, it is met with growing resistance from suit-wearing jihadis – like the terrorist group Hamas doing business as the Council on American Islamic Relations (CAIR). The ACLU, the Southern Poverty Law Center, and most local and national media outlets join the jihadis (“terrorists”) in calling for our program to be shut down because it “offends” muslims. This despite the fact UTT continues to offer to remove any information in the program that can be factually disputed. These same threats are levied against anyone holding events around the nation speaking truthfully about the Islamic threat such as Robert Spencer, Pamela Geller, Dr. Bill Warner, and others. These are overt threats and the ACLU, SPLC, and media are complicit in aiding and abetting terrorists in threatening citizens. If the Department of Justice will not act to protect U.S. citizens from this obvious threat, the citizens will eventually stop waiting and take care of themselves. Sharia-adherent Muslims had been threatening to kill people for speaking the truth about Mohammed (and Islam) for 1200 years when John Quincy Adams, the 6th President of the United States (1825-1829), prior to being elected to the U.S. House of Representatives in 1830, penned a comprehensive essay about him, and the affect his earthly existence had on the world. Said essay originally appeared in: THE AMERICAN ANNUAL REGISTER FOR THE YEARS 1827 – 8 – 9; THE FIFTY SECOND AND FIFTY THIRD YEARS OF AMERICAN INDEPENDENCE; NEW-YORK, PUBLISHED BY E. & G.W. BLUNT; 1830; (29:267-402). http//www.archive.org/stream/p 1 americanannual29blunuoft. To read said essay by President Adams, see: http://www.apologetics.org then click-on “America’s Culture War” (on the top horizontal bar). Said site appears to be impeccably researched and contains a profusion of contextually relevant data which I suspect may be of keen interest to UTT and it’s followers. Too, the “Islamophobia” scam is completely unwrapped.